Wayne writes: Late last summer, I was asked to write about some aspect of the work of Maurice Sendak for the Newsletter* of the Children’s Books History Society, as part of an extended obituary and appreciation – Sendak had passed away in May 2012. I chose to focus on two of my favorite Sendak books, The Sign on Rosie’s Door (1960) and The Nutshell Library (1962). For the sake of context, however, I looked again at the complete range of Sendak’s work, and in the process recalled that he was once engaged to illustrate a deluxe edition of The Hobbit for J.R.R. Tolkien’s primary American publisher, Houghton Mifflin (now Houghton Mifflin Harcourt). Thereby hangs a tale which has been confused in the telling. News of this might-have-been Hobbit briefly dominated geek websites in March 2011. The key article was written for the Los Angeles Times ‘Hero Complex’ page by Spiderwick Chronicles creator Tony DiTerlizzi. ‘Reinterpretation’, he argued, is ‘integral to the lifespan of a classic, whether book or film’, and each generation of readers should have an edition of a timeless story that speaks directly to them, in a style and design they find familiar. For DiTerlizzi, Maurice Sendak, the beloved Caldecott Medal-winning author-illustrator of Where the Wild Things Are, was ‘the perfect visionary to reinterpret’ Tolkien’s Hobbit. says that Sendak was invited to illustrate The Hobbit ‘in the late 1960s’; in fact, Sendak signed a contract in 1964, and asked for a couple of years to do the work. 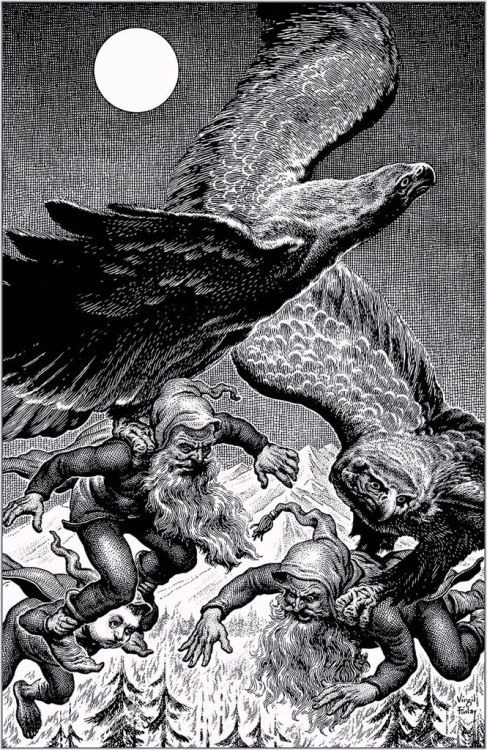 The article implies that the only hurdle to Sendak’s involvement was Tolkien, who in 1967 ‘was still overseeing his Middle-earth empire’; in fact, Tolkien had already, in 1963, allowed Houghton Mifflin to get on with a deluxe ‘Hobbit’ to be illustrated by Virgil Finlay (who seems to have dropped out; Tolkien made some positive comments on his sample picture), and when Sendak was proposed he continued in the same manner. Far from ‘overseeing an empire’, by which we suppose Mr. DiTerlizzi means micromanaging, Tolkien tended to defer to his publishers on business matters. Sendak may have made sample drawings ‘begrudgingly’, but they seem to have been expected of him by all concerned, as from any artist, even one so distinguished. In regard to the misidentification of the ‘wood-elves’ drawing, the correspondence between Houghton Mifflin and Allen & Unwin in January–February 1967 clearly refers to only one image sent by Austin Olney at Houghton Mifflin, received by Joy Hill at Allen & Unwin, and shown to Tolkien by Rayner Unwin: the picture of Gandalf and Bilbo. Tolkien saw it on 16 February 1967, and on 20 February Rayner wrote to Houghton Mifflin that Tolkien was not ‘wildly happy about the proportions of the figures’, Bilbo being too large relative to Gandalf. There is no indication that Tolkien saw a picture of dancing wood-elves, so any mislabelling ‘blunder’ was of no consequence. We might have added that DiTerlizzi’s fulsome praise for the ‘spec pieces’, comparing them to ‘etchings by the likes of Rembrandt and Samuel Palmer’, could hardly have applied to more than the one sample drawing (of Bilbo and Gandalf), since – as DiTerlizzi himself noted – only this drawing is known to survive, along with Sendak’s marked copy of The Hobbit, in the Beinecke Library of Yale University; he could not have seen the ‘wood-elves’ drawing, which is nowhere to be found. In 2004, Christina and I were invited to attend a session of the Children’s Literature New England conference held in Williamstown, at which Sendak was the guest of honor and was interviewed on stage by Gregory Maguire. The story of the aborted Hobbit came up. Sendak spoke with indignation about what had happened, but Christina and I knew that what he recalled didn’t match the archival evidence. Of course, it may be that Sendak misremembered, or that he recalled only what he had been told by Houghton Mifflin; it may be that their account was garbled, or altered to make it less displeasing to an important illustrator; or it may be that Sendak’s ‘wood-elves’ drawing was thought so poor by publishers’ intermediaries that it was deliberately withheld from the author – who, after all, had already illustrated The Hobbit himself. Sendak’s drawing of Bilbo and Gandalf appears to have been done quickly, perhaps under pressure to produce an overdue sample. I wonder if Sendak was ever fully invested in the project – it would be interesting to see what he wrote or drew in his working copy of The Hobbit, as a gauge of his dedication. When Sendak was approached by Houghton Mifflin about The Hobbit at the beginning of 1964, Where the Wild Things Are had just been published, though it had not yet won the Caldecott Medal. Sendak had received four Caldecott Honor awards, so was already an illustrator of some repute. The cachet of a Caldecott Medal (announced in March 1964 and accepted by Sendak in June) changed the game dramatically. Although Sendak thought that work on The Hobbit would take only two years, three went by before he produced trial art. In the meantime, he illustrated several other books. He never lacked for projects, and after Where the Wild Things Are became enormously popular, he had enough financial security that, having illustrated so many books by others, he was eager to assert, in a way greater than he already had, his own preferences and taste. At any rate, in 1964 the editors at Houghton Mifflin probably had Where the Wild Things Are particularly in mind, at least as proof that Sendak could handle a tale of ‘there and back again’, if a very short tale compared to Tolkien’s book. It was Sendak’s most ambitious and most impressive work to that date, though in some respects a development of his most common style, influenced by comic strips and cartoons. But he had also made some increasingly sophisticated and very successful ink drawings, based on nineteenth-century illustrations, an influence already at the beginning of his career. Many of these appeared in the Little Bear series by Else Holmelund Minarik, which began in 1957. By the time he made his Hobbit specimen, Sendak had done elaborate pen work for (among others) a 1966 collection of stories by Isaac Bashevis Singer, George Macdonald’s The Golden Key in 1967 (another near-connection with Tolkien, who had been asked to write the introduction but bowed out, transforming his work into Smith of Wootton Major), and, also in 1967, Sendak’s own Higglety Pigglety Pop! His Hobbit specimen suggests that he would have illustrated Tolkien’s book in this vein. Would his more developed drawings – especially his very accomplished pictures for The Juniper Tree and Other Tales from Grimm (1973) – been to Tolkien’s liking? Maybe so, if Sendak had paid attention to Tolkien’s descriptions and visual clues, and if his art was not too outlandish. Tolkien wrote, concerning Virgil Finlay’s sample art for The Hobbit: ‘as long (as seems likely) he will leave humour to the text and pay reasonable attention to what the text says, I shall I expect be quite happy’. And also: ‘With regard to the “redressed” American Hobbit, I am inclined to let Houghton Mifflin get on with it according to their own taste.’ I have no doubt that Sendak too would have been allowed to ‘get on with it’, in some mutually agreeable form. But he never returned to The Hobbit after recovering from his heart attack. Christina and I have found nothing in publishers’ archives to explain why. It may be, as Sendak’s fame continued to grow, that Houghton Mifflin ultimately couldn’t afford him, or that he became more interested (he certainly became more involved, and was very skilled) in designing for theatre and opera. In any event, as Sendak said in his speech accepting the Hans Christian Andersen Medal in April 1970, his ‘passion for making books’ had given him ‘a distinct vision’ of what he wanted his books to be, ‘a vision difficult to verbalize. I am now in search of a form more purely and essentially my own.’ If Sendak had illustrated The Hobbit, I’m sure the result would have been worth seeing, if probably not the masterpiece above all masterpieces that Tony DiTerlizzi predicted. * My article was published in the March 2013 issue. The most notable thing about traditional literature up to Tolkien is their agrarian character. While the media monopoly and their hirelings, from Lemony Snicket, to Spiderwick, and Wicked, are corporate and urban. Tolkien just can’t be digested by casino capitalism in his tweed jacket and pipe, although the Los Angeles times would like to do so.